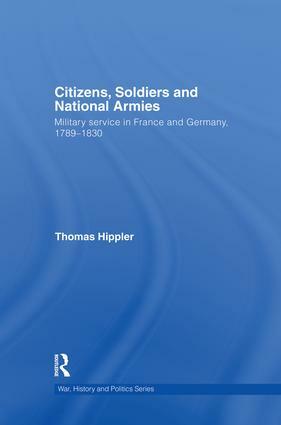 This book examines the creation of ‘national armies’ through compulsory military service in France and Prussia during the French Revolution and the Prussian Reform Period. The French Revolution tried to establish military and political structures in which the armed forces and society would merge. In order to ensure that the army would never become a means of oppression against the people, the whole population should thus ‘be’ the army. Defeated by the enormous military potential that these new political settings had unchained in France, Prussia adapted the French innovations to its own needs, thus laying the basis for its contributions to the victories of the coalition troops in 1813-15. Conscription had implications that went beyond the purely military sphere and involved assumptions about the nature of the state and its relationship to its citizens. It was the material basis of Napoleon’s campaigns and of the German ‘wars of national liberation’ of 1813-15, before becoming a cornerstone of the Prussian Reforms and the creation of a civil society ‘from above’. Military service has therefore been one of the most essential and contradictory institutions of the modern nation-state. Citizens, Soldiers and National Armies will be of interest to historians of modern Europe, military historians and students of intellectual history in general. Thomas Hippler is a research associate in the Department of Politics and International Relations at Oxford University. He holds a PhD in History from the European University Institue, Florence.